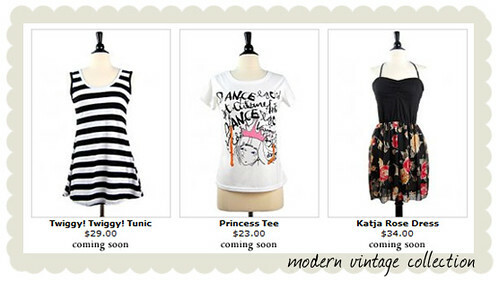 ADORED VINTAGE: Preview: Modern Vintage, new goodies coming soon! Preview: Modern Vintage, new goodies coming soon! I am so excited about the new "Modern Vintage" clothes, everything is just so cute! I really love the "Princessa T-Shirt" the art on it reminds me of the illustrations from The Little Prince. With a cute little polka dot skirt and ballet flats, that would be one seriously adorable outfit! Don't you just love how Kate Moss wore black and white with brown? Ahhh I love Kate! There's a reason she's called a fashion icon, and I have crazy closet envy for Kates entire wardrobe. Man I love black and white stripes. Will have to keep an eye out for the tunic! Nice dress I like all your collections. I love modern vintage clothing. All my friends wear 80's and neon clothing. I don't wear that. I wear stripes and lace. I love small flower prints on skirts with a t shirt from some old band that was popular in the 50's.